We’d love your help. Let us know what’s wrong with this preview of Everything Is Just Fine by Brett Paesel. Coach Randy is working mightily to keep it togeth In this brilliant, laugh-out-loud satire, image-conscious parents on a Beverly Hills junior soccer team struggle to keep up appearances as their private lives careen out of control. To ask other readers questions about Everything Is Just Fine, please sign up. This is truly a book for anyone who has or has ever had a child in minor league sports, mine played baseball and hockey. Whatever your perspective, you will laugh out loud at the familiar situations and characters. Brett Paesel has written a thoroughly enjoyable and wickedly funny book, which is difficult to put down. Whether you are in a good mood and want to tickle your funny bone, or you’re despondent and want to be cheered up, Everything Is Just Fine will lift your spirits at the same time that it will remind you about what’s really important in life. This is a fun, poignant, and clever read and the subject matter was so relevant in today's society. Towards the end we get a little darker perspective, and that was OK. It really balanced the book out. I didn't think I would enjoy a lot of email exchanges but this book was a delight to read. The writing is excellent - very descriptive and written in a conversational tone. The narrative bounces between the main characters and you truly feel like you are in conversations with them. Ms. Paesel has the ability to take ordinary events, exaggerate them slightly and the results are hilarious while also drawing attention to the ridiculousness of life in general. Paesel's writing is serious, but witty without heaviness, and is poetic, visually beautiful, emotionally moving and deeply philosophical. Such a great story - a little "slice of life" as I like to say. Very well done. Thank you NetGalley, Grand Central Publishing and Brett Paesel for the opportunity to read this book in exchange for an impartial review; all opinions are my own. I'm probably in the minority, but I didn't like reading a book in email format. Otherwise, Everything Is Just Fine is a good story. True to life based on the people I know! It's funny and witty. If you have kids and sports, this one is for you. Thanks to NetGalley for an arc in exchange for an honest review. This is a definite favorite! Loved it, easy reading and plain good writing. After reading the book,I checked out author. No wonder book was so fantastic. Author has many awesome credits. Read this funny,but REAL book. Thanks to author,publisher and Netgalley for the chance to read this book. While I got the book for free,it had no bearing on the rating I gave it. With her latest work, "Everything is Just Fine," Paesel delivers an engrossing satire about the frenetically hidden vulnerabilities of a group of Beverly Hills soccer parents and coaches. These vulnerabilities are revealed via a chain of team emails, private texts and IMs, and varied narrators. This format is a clever way to allow the reader to differentiate between the novel's many characters early on, thanks to the personal writing quirks of each individual and what these quirks imply. There ar With her latest work, "Everything is Just Fine," Paesel delivers an engrossing satire about the frenetically hidden vulnerabilities of a group of Beverly Hills soccer parents and coaches. These vulnerabilities are revealed via a chain of team emails, private texts and IMs, and varied narrators. This format is a clever way to allow the reader to differentiate between the novel's many characters early on, thanks to the personal writing quirks of each individual and what these quirks imply. There are time stamps revealing immediacy of response, excess exclamation points and smiley faces, over-the-top signature quotes, and the garbled typing indicative of a solo wine binge. The emails begin with a mix of forced jocularity and passive aggressive swipes-- enough to leave the reader with a sense of secondhand embarrassment. As the story progresses, the pedestrian pettiness proves a poor cover for escalating marital discord, struggling children, financial difficulty, affairs, and willful denial. It is only when various characters allow their masks to slip, and they begin to invest in each other, that they achieve any semblance of personal growth. Paesel brings us characters who are, at times, painfully annoying, while simultaneously granting them a depth of vulnerability that allows us to care for and relate to them. In other words, they are endearingly human. We have all, at one time or another, known, cared for, or been one of these people. Though "Everything is Just Fine" ends with a faint air of hope, it is a dark comedy, as depressing as it is funny, the contradictory elements inherent to human nature laid bare.This book will make you laugh, cringe, and sigh. Thank you to the publisher and NetGalley for an advance copy of this novel in exchange for an honest review. Everything is Just Fine is full of things I love - broken people and ordinary problems that spiral into terrible secrets. The story revolves around a group of parents involved in a children's soccer team. There are some standby stereotypes - overzealous mom, philandering husband, semi-alcoholic divorcee. The characters are well developed, however, and come across as genuine - sometimes cringingly so. Set in Beverly Hills, this is a fun read where you don't feel compelled to root for anyone. The s Everything is Just Fine is full of things I love - broken people and ordinary problems that spiral into terrible secrets. The story revolves around a group of parents involved in a children's soccer team. There are some standby stereotypes - overzealous mom, philandering husband, semi-alcoholic divorcee. The characters are well developed, however, and come across as genuine - sometimes cringingly so. Set in Beverly Hills, this is a fun read where you don't feel compelled to root for anyone. The story is told through a series of team reports / group emails, personal correspondence, third person narration and one IM transcript that made me happy the author didn't try to include another one. The story is also told from different perspectives and, for the most part, it moves along at a good clip. The only problem is that the plot does sag in the middle and becomes easy to skim read. Anything based so closely on real life always runs the danger of becoming tiresome and that is an issue in this book. Still, it's a fun read and throws enough curveballs that readers will be entertained. In many parts it reminded me of suburban comedies like Desperate Housewives, American Housewife or even Pretty Wicked Moms. 23 Word Review: Group of parents survives a kids soccer season. Rich kids, broken parents and enough schadenfreude to keep you reading 'just one more chapter'. "Sometimes when we lose, it's hard to remember that a lot of great things are still happening." The plot didn't intrigued me that much but when I started reading, oh boy, I couldn't stop. I'm not a parent nor do I like sports but the narrative was so good! I loved that the story was told from different viewpoints and e-mail conversations. The characters were well drawn in their language. Some were truly annoying but so real. Following their lives was really entertaining. Balancing secrets to main "Sometimes when we lose, it's hard to remember that a lot of great things are still happening." The plot didn't intrigued me that much but when I started reading, oh boy, I couldn't stop. I'm not a parent nor do I like sports but the narrative was so good! I loved that the story was told from different viewpoints and e-mail conversations. The characters were well drawn in their language. Some were truly annoying but so real. Following their lives was really entertaining. Balancing secrets to maintain the picture of a perfect life, the characters struggle with marital and divorce problems, insecurities and unhappiness. It's funny, hilarious and I still think about poor Randy. It's emotional and sad while being entertaining. Very humane and depressing but with great comedy. *I received an advance digital copy of this book via NetGalley in exchange for an honest review. I really enjoyed this book. It was an easy read that conveyed much of the story through email exchanges. (I noticed a lot of grammatical errors, but I soon realized they were intentional as they were representative of the characters who were writing the e-mails.) The characters were well-developed, and I liked that I could really get inside their heads. I found this book had a great balance of being entertaining and emotional. Overall the book is very well-written, and not that this has much rel I really enjoyed this book. It was an easy read that conveyed much of the story through email exchanges. (I noticed a lot of grammatical errors, but I soon realized they were intentional as they were representative of the characters who were writing the e-mails.) The characters were well-developed, and I liked that I could really get inside their heads. I found this book had a great balance of being entertaining and emotional. Overall the book is very well-written, and not that this has much relevance for a book review, I think this book could easily translate to a major motion picture. Thank you to NetGalley for providing me with an advanced copy of this book in exchange for my honest feedback. I was surprised at how much I loved this book. While satirical, at its core it’s a book about the intricacies and the delicate processes of our relationships and how we react to what life throws at us. Paesel does an excellent job at creating heavy situations for the chacacters but balances them out with humour and a light-heartedness that is surprisingly relatable. I both know these characters in my everyday life and can relate to their inner thought I received this book in a Goodreads giveaway. Solid story, I enjoyed it thoroughly. Lots of laugh out loud moments. The story follows the lives of soccer parents (and their kids) who live in Beverly Hills over the course of one soccer season. The plot is so far removed from my own lifestyle I actually have no idea if the actions and emails are accurate but I still loved it. The first half of this book was awesome. I love the texts/emails interspersed throughout. All the characters were equally sad/empathetic/loathsome. The kids too. Watching everyone's dramas play out was fascinating. But then we got dragged into the endless misery of Coach Randy, that went on and on. And then the bit at the end with Patrick was like, wut. I didn't get it. 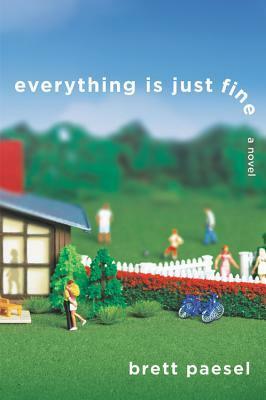 Everything is Just Fine is a whirlwind cyclone of crazy events, situations and mess ups that happen to the parents of a Beverly Hills youth soccer team. As you move through the pages, things get messier and wilder than imaginable. People struggling with their true failures. Messy remains of divorces. Cheating spouses. All the while, they root for and encourage the kids on the soccer team. 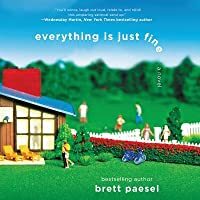 Thanks Goodreads for my copy of Everything is Just Fine by Brett Paesel. I enjoyed reading this book because it was an original storyline. It also was funny in a sarcastic way as anyone who has been a parent with children in sports will relate to. How this writer thinks of the situations our main protagonist finds himself in and his thought processes is a marvel to me.Kudos. On the surface, a novel about a soccer league in Beverly Hills may not seem like much of a compelling read but the author's style and humor made this a super fun and enjoyable read. I even found myself relating to some of the characters and was fully invested in how everything would shake out. As the book itself reminds us, not everything is as it seems. This book is a very real and modern take on what being a grown up is like these days. Through emails, soccer practice side talk, and the children, we learn about the ups and downs of the parents of this soccer team based in Beverly Hills. The context, which I am hoping isn’t relevant for my kids’ baseball teams, reveals the emotions of infidelity, naivety, divorce, job loss, and lots of secrets. Thank you NetGalley and Brett Paesal for the ARC in exchange for my honest review. I loved LOVE LOVED the cover of this book which is why I requested it. If Class Mom was the book for class moms, then this is the book for SPORTS parents. Honestly, its easy reading, laugh out loud funny and just great writing. I received an advanced digital copy of this book from Netgalley.com, the author and Grand Central Publishing. Thanks to all for the opportunity to read and review. Everything is just fine, unless you're a member of the Beverly Hill Junior Soccer league. The perfect tale for the age of the Soccer Parent, and a parable of current social norms. Parents are irresponsible and children are caught in the middle. Funny at times and heart wrenching the next, this book will make you look at the folks on th I received an advanced digital copy of this book from Netgalley.com, the author and Grand Central Publishing. Thanks to all for the opportunity to read and review. Everything is just fine, unless you're a member of the Beverly Hill Junior Soccer league. The perfect tale for the age of the Soccer Parent, and a parable of current social norms. Parents are irresponsible and children are caught in the middle. Funny at times and heart wrenching the next, this book will make you look at the folks on those sidelines differently. Very differently. While I felt like the writing was jumbled and a bit chaotic and there seemed to be too much going on in the story, the character development, especially with Diane, was top notch. I liked the way the emails helped show all the sides of her personality. The people were real people with real problems that didn't miraculously get better at the end of the novel. All in all, a good story.